The third diver on the intro dive had a GoPro with him so if we are lucky I may be able to share some footage / screenshots soon. Will update the post then and send out a tweet from @ChaseTravelBlog if you are interested in seeing them! 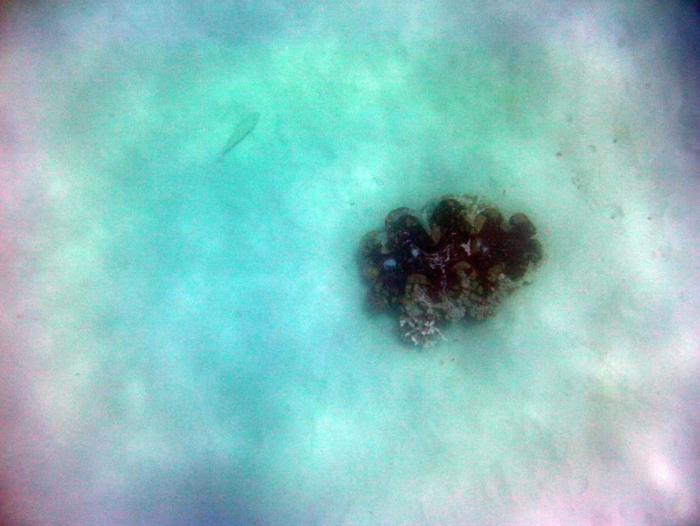 As part of our tour with Seastar, Cairns we were able to book an introductory dive session which we decided to go for. 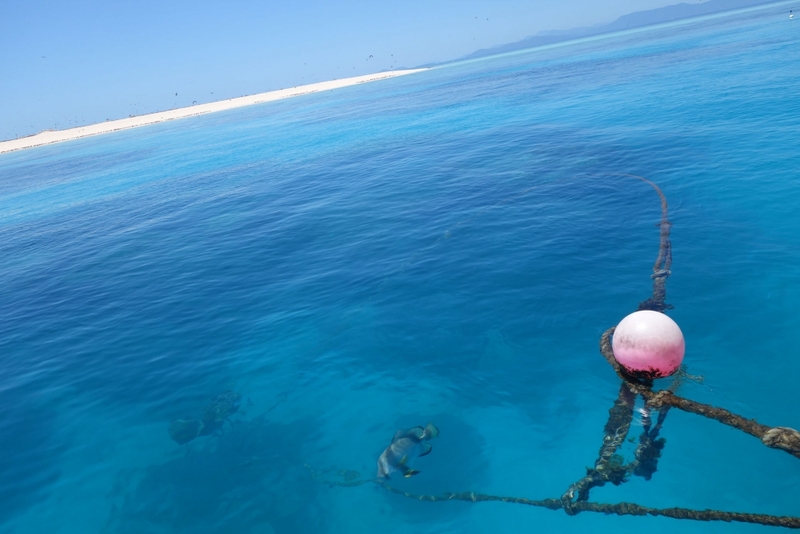 The dive was to take place at Michaelmas Cay - a shallow area of middle reef and part of the Great Barrier Reef. It turned out that only 3 of us on the trip had opted in for the dive so, while everyone else was getting ready for their first snorkel of the day, we sat down with Alexis, our instructor for a brief on the basics of scuba diving. She took us through exactly what was going to happen on the dive and introduced several skills we would need for the dive including hand signals, clearing water from the mask nose and how to take your mouthpiece (the bit you really need to breathe) out of your mouth underwater and put it back in. Dive groups are kept quite small with a maximum of 4 in each; In our case, as only 3 people were diving, our dive group consisted of 3 'pupils' and instructor. We were set up with our weigh belts and (really heavy!) air tanks and were ready, sat nervously on the back step of the boat as the final checks were carried out and we were shown how to use everything. I was given the honour of being the first to take the step off the edge and into the water (yayyyy) so after being counted down, merrily fell off the back if the boat and into the sea. It's a strange feeling breathing through a regulator with your mouth submerged. While the others dropped into the water behind me I had a bit of time to readjust to the feeling. The initial adrenaline of the small jump kicks in and you really feel your breathing rate go up, being fought by the regulator and your blocked off nose. 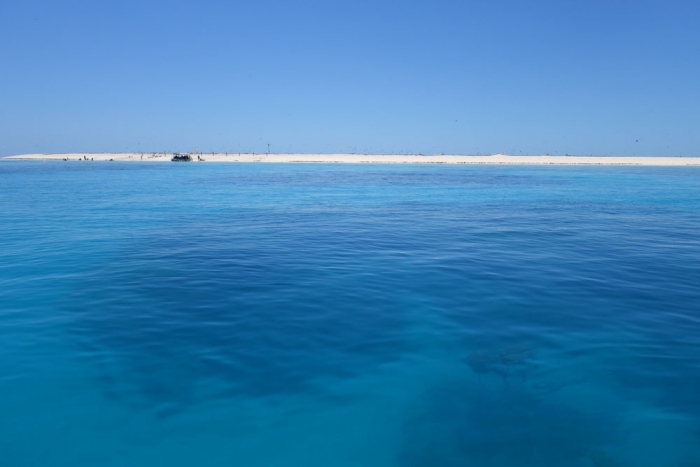 There definitely is a bit at the start that you really get a bit of a panic as you hold on to the edge of the boat, your face partially submerged, trying to get your breathing under control. Nothing is rushed though and you have plenty of time to get used to it - just push through and keep trying - resist the temptation to pull out the mask and breathe normally. After a while of pushing my head under, staring at the fish sheltered under the keel who were in turn staring back at me, I slowly got used to the feeling - it's easy to focus on your breathing because it's pretty much all you can hear and the bubbles course over your mask at each exhale. As we got more comfortable with this completely alien feeling, Alexis was down with us keeping an eye on us with questioning 'ok?' gestures to make sure everything is alright. Once we had slowly lowered a bit deeper under the boat, still hanging from a rope on the side, we each took turns repeating each of the skills to make sure we knew what to do and had attempted them underwater. I gathered from Lisa's expression when her turn came that she wasn't super excited about taking the regulator out of her mouth, but she managed nonetheless without any issue! The tour itself was quite basic compared to the drama of the beginning. Again, slowly, we all pulled ourselves down the anchor line, stopping every metre or so to make sure our ears were equalised. At the bottom, maybe 7-10m below the surface, we linked arms and as a conjoined mass were towed by Alexis to a giant clam on the seabed. If you poked it, it would close which was a fun distraction to where we where! We continued our 'towed' tour around a small reef, starting to be able to pay more attention to the surroundings and moving rather than just breathing, before we found ourselves back at the anchor point and ready to ascend. I think at this point I was finally feeling more acclimatised to being able to breathe underwater and, as surprised as I am to say this, was almost sad to head back to the surface and get back on the boat! It was an amazing experience - one more novel than most other things we have ever been able to do - and I'm really glad we did it. There were a lot of points where we could have backed out, and the temptation can be strong to do so, but if you fight through, it is totally worth it! There is a long list of medical conditions that need to be declared before you dive - many of which such as high blood pressure you will accumulate as you get older. It's unclear whether these are just for the information of the instructor or whether they will fully exclude you from the dive, but it is worth knowing. More importantly, it should encourage you to try diving while you are young and healthy! If you want to find out how the rest of our Great Barrier Reef trip went, check out the full Great Barrier Reef tour with Seastar post.